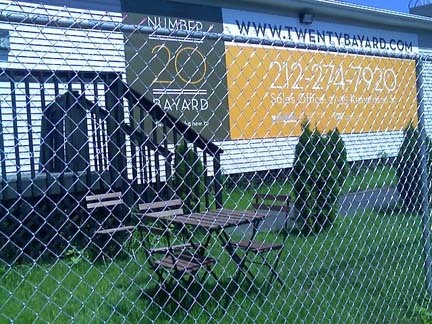 I love walking by the sales trailer for 20 Bayard because they have all these funny little tables and chairs carefully set up around the trailer and nobody's ever sitting in them. I like to imagine someone pondering whether or not to empty their trust fund for a gazillion-dollar apartment whilst perched atop one of these fragile little chairs. I wonder if the broker offers to sweeten the deal by running down to the 5-11 on the corner and picking up a couple bottles of Snapple and maybe a delicious cheese steak to share. And can there actually be any real contract signing on a slatted table? It seems unwieldy and impractical, but what do I know. . . I'm just a renter. I swear this is true. My friend delivers pizzas here in Lincoln, Nebraska and we have these massive, hideous, expensive new homes in the south part of town and they all look like branch offices of banks. Well, he tells me about twice a week he'll deliver a crappy pizza to one of these houses. The wife answers the door and he looks in and their dining room table is a picnic table and their chairs are foldable ones from the hardware store. None of the windows have curtains and they all have $12.99 white blinds from ACE. You notice the Lexus SUV in the driveway, see them at the ugly country club across the street. Will you be opening a checking or savings account, Sir?